Onto the Mighty Barony of the Citadel of the Southern Pass do we, Tariq and Elieth, Shayk and Shayka of these great lands send greetings! We write today as we see the end of our days fast approaching. We have joyfully served Crown, Kingdom, and Barony over these last four years but alas, the time has come for us to step aside for a new Baron to lead the Citadel to further greatness. Before we go into retirement and take our place in Citadel’s history, however, we wish to thank all of you for your confidence in us during our tenure. Although we have been at the head of the Citadel over the last four years, we have not been alone. So many of you, both members of our populace as well as from outside our lands, and even beyond the borders of our beloved Kingdom have given us your boundless and unwavering support. It is this support and encouragement that has made it possible for us to succeed and for the Citadel to thrive. Though we lament that our time as Baron and Baroness is drawing to a close, we are joyful that we leave a successor that that is very motivated and full of new ideas that will take this Barony to new heights. We are sure that he will have the same unwavering support that we have enjoyed as we led this Barony over the last few years. We look forward to this new chapter of the Citadel and are proud to be a part of her populace. We invite one and all to join us this Saturday, April 13th at the Kingdom Arts and Sciences Competition, Queen’s Prize and Citadel’s Baronial Investiture. There are many fine activities planned throughout the day and a fantastic feast in the evening following the investiture of our new Baron, His Lordship Bernardo dei Medici. Come and see the best that our Kingdom has to offer in the realm of arts and sciences as artisans from all corners of the land come together to compete to become the next Kingdom Champion. Further information about the event can be found on the Citadel website (www.southernpass.org) under upcoming events. We look forward to seeing you all there. 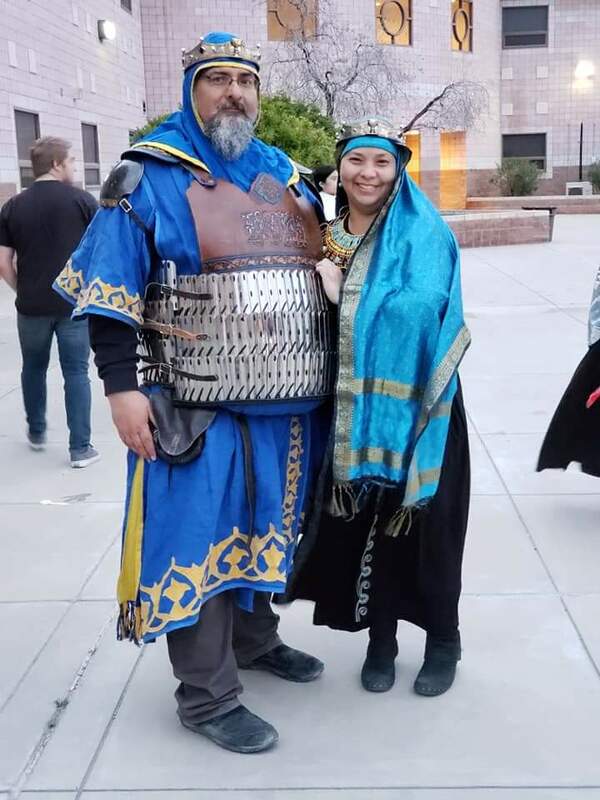 Greetings from Tariq and Elieth, Baron and Baroness of the Citadel of the Southern Pass!